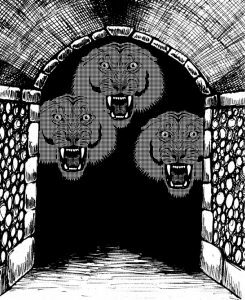 The sound of stone grinding against stone filled the mages’ ears as the solid black-stone door slid down into the floor stopping with the finality of a thud. That door would never close again. A large central fire lighted the oblong octagonal chamber before them. The walls were of the same dull black stone as the rest of the place and floors were polished white marble tile. The ceiling was flat and very high. Directly to the south was an elevated platform with white stone steps leading up to its top where sat a small silver box with wood panels. Supporting the western and eastern walls were a pair of thick but plain black pillars. Against the southerly diagonal walls, one to the east and the other to the west sat large iron-banded oak chests. Gornix (played by Gil) immediately prepared to run in to one of the large chests and Excor (played by Cris) was eyeballing the small silver box. Fauna (played by Jenn) and Szoosha (played by Isis) stopped the Salt-Lotus Wizard from blindly charging into the newly opened chamber. They pointed out the giant lion-like creature lying at the center of the room, the firelight being at the tip of its tail. Its three heads were rousing but still groggy. In a rumbling voice that they felt more than heard, the central head spoke. However, the mages did not speak its language nor did they want to “waste” any spells trying to understand what it had said. Fauna immediately charged in casting Lightning Bolt. The bolt struck the beast with no effect. Gornix on the other hand, moved in cautiously to the side and using his Dark Secret wizard ability was able to let the others know that it was immune to electricity. He also gave them a pointer on how to take it out which was mostly an educated guess. Meanwhile, Excor cast Shadow Ribbons and amazingly bound the monster. The creature struggled against the shadows. 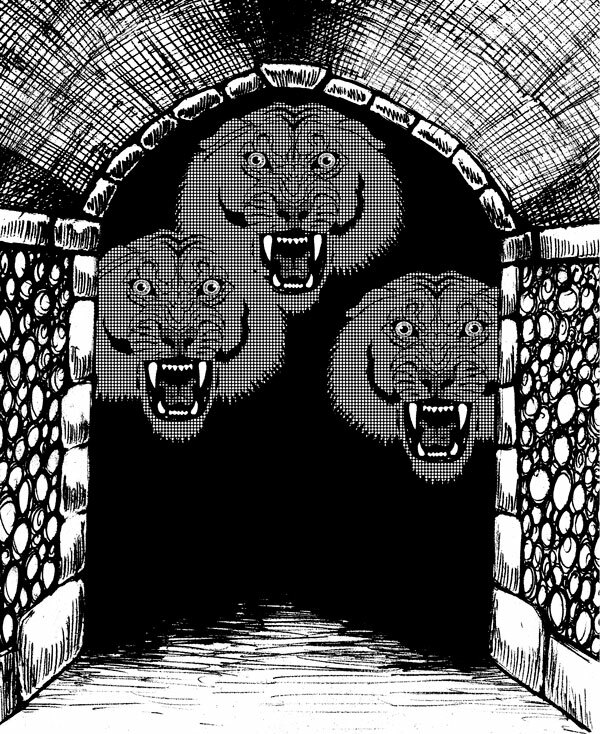 All three of its heads roaring a horrific bone quaking roar of rage and confusion but the mages were unshaken. Szoo cast Elemental Half-Plate Armor (fire) on himself. While the players all yelled at Jenn that the monster was immune to electricity, Fauna cast Lightning Bolt on it yet again. Gornix cast Amplify Magic his spell easily penetrating the monster’s resistance. Excor cast Slow on it, his magic also penetrating its resistance easily. The beast spat a fireball from its central head catching Fauna, Excor, and Gornix in the ensuing blast of swirling flames. Fauna stumbled but was saved by her Mage Armor, which was dispersed. Gornix took half damage having forgotten to engage his Shield and Excor’s Mage Armor absorbed the damage but was greatly weakened (not many Hit Points left). He had used an item to don it just before Gornix had opened the vault door. Szoo summoned his flaming naginata and charged in. Gornix cast Force Ram at the creature crunching in some of its ribs wounding it horribly. Excor cast Paralyze II at it, his magic again easily penetrating its resistance to magic. Szoo put all his strength behind his blow as he rammed his weapon into its battered and bleeding side. However, the flame born weapon couldn’t penetrate its hide. Gornix slung another Force Ram at the creature dealing it a crushing deathblow. The beast’s massive corpse slowly faded into nothingness. The battle was over. The mages assessed the damage, only Gornix had been wounded in that fight but he dismissed it as “nothing”. They spread out inspecting but not touching the chests and box. Fauna checked the stairs leading to the top of the platform for traps, seeing none she ascended to the box. In response, Excor stepped out of the room and prepared to duck behind the stone jamb. Fauna took her time inspecting the box and the platform upon which it was resting. She found that the box had already been opened a long time ago and it was definitely trapped. She figured that it sat on a pressurized crevice that if it were removed would unleash poisonous gas from a hidden reservoir. Gornix tried to sense magic on it but was unable to get anything so instead he got a little frustrated. Consequently, he cast Breath without Air on himself. Fauna backed off to the bottom of the stairs. Szoo left the room and ducked behind the doorjamb opposite Excor. He tried to identify the box but it was just a box. Therefore, he attempted to disarm the trap. Fauna retreated to the others. He failed to disarm it. Suddenly, a large several inches thick blue-steel door started to slide down over the lone entrance. Thinking quick, Excor tossed Gornix the Portable Hole. A second later, the door slammed down sealing the room airtight. A vast amount of gas billowed from the square hole the box had formerly concealed. Gornix was now at the center of the room with the hole in his hands. He tossed the silver box in as the billowing gas snuffed out the last vestiges of his vision. The gas was sickly green and very thick. It blotted out all light blinding all normal vision. He was in pitch black even though he tried to light his way with his staff. Gornix carefully felt his way slowly around the room to the first chest. He holed it up suddenly feeling and hearing a huge torrent of gas blasting into the room causing his ears to pop with the pressure. He slowly moved across the room to the other chest. Almost tripping at about the center of the room, he was able to maintain his balance. He edged ever closer but had a little bit of a struggle to feel out the second chest. The gas chilled his skin. He could feel it billowing through his hair and between his fingers. Eventually he found the second chest and holed it up as well. Once again, he triggered the trap concealed by the chest and again a huge ice-cold gust of gas hissed into the room. Consequently, Gornix felt the building pressure in his lungs now and the gas was leaving a sticky residue over his skin, in his hair, and on his clothes. So, he moved quickly towards the metal door keeping his hand on the wall after he felt past the pillars. He made it easily to the now freezing blue-steel and used Ghost Step to exit the gas-filled chamber. He “prestidigitized” himself clean. Fortunately, the toxin did not seem to be a contact poison. Jenn and Isis burst out into hysterical fits of maniacal laughter. Gil just clinched his eyes shut and put his hand over his face. Cris flipped the two women the bird. The Cabal of Eight Pt.44: Betrayed at Last!